I am so excited to share my completed MSBHQAL top! I know I am way early and could possibly be labeled as nerdy or a teachers-pet, but I don't care because these blocks are seriously fun and addicting! I couldn't stop. The schedule was to make three blocks a week but I just kept making them until I was out of every last scrap of fabric...no joke. I used one jelly roll to make 18 blocks. I made my top with the same 1" sashing and then 2 1/2 inch border. I plan on basting the second I hit publish on the post and then hope to quilt it by the weekend. As soon as I pieced together this top, I took the two extra blocks to make pillows. One is for me (of course) and the other for a friend who is moving into a new house, with a toddler and pregnant...OUCH! She deserves a metal as well. Anyway, she loves bright colors and has a purple couch...so perfect! I hope she keeps that purple couch for the sake of this awesome pillow! I kid...sort of. 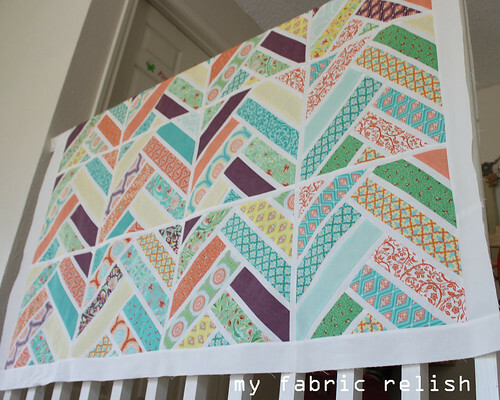 Linking up with all my fun friends on the right and Crazy Mom Quilts. ps - I think I am skipping this weeks Zakka 2.0. I'm going to focus on finishing this quilt and then get started on some quilts that I have floating around in my head...don't want to lose the momentum. Ya know?! Hey there Jessica!!! <----that's me waving! Lol. Thank you!! Wow, that's just beautiful and the pillows are adorable. Amazing work. I'm still a block short on last week and feel like I'm playing catchup all the time. Thank you!!! Hope you get some MSBH energy and catch up! I know the feeling, though. Aren't they fun to make?!?! thank you thank you thank you for my precious pillow!!! We are keeping the purple couch, but it's been moved to the master bedroom;) You're so thoughtful!! Yes! I am not the only one ahead of schedule! I have been holding back on posting about it, but now I can. 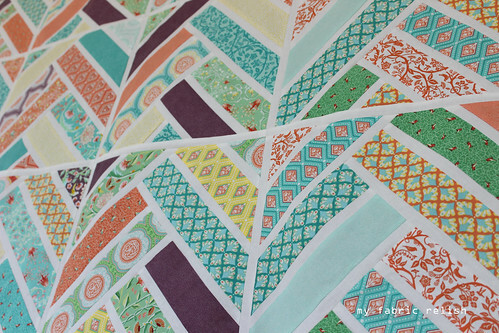 Your quilt top is beautiful, Melissa! The white sashing and borders really make all those lovely fabrics sparkle! And the bonus pillows - Gorgeous! What a great friend you are to be willing to gift one! Love the way you quilted those, too. Congrats on a super duper finish! High five!!! Post away!!! Hehe I'll be looking for your post so I can see yours. Thanks for stopping by and the sweet comment. Beautiful quilt and pillows! You are SO funny! Making me laugh! LOVE it! your blocks are beautiful! Thanks Kelly!!! 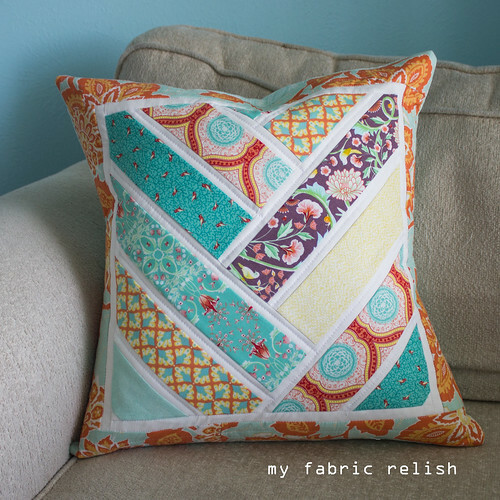 Using the jelly roll makes it so easy! jelly roll...hmmm. might have to try it! Thanks for linking up to Needle and Thread Thursday! I'm doing the MSBHQAL, too, but unlike you, I'm way behind! Beautiful work. I hope mine turns out half this nice. Oh, I'm never on my game like this! It totally helped that both kids started preschool the same time this one started. Lol. I'm sure yours with be awesome! It's hard to make these blocks look bad! Your way at the front. I guess I better dig in and get it done. It's lovely and inspiring! Haha...Yvonne...you need to join me! I'm saving seats! Thank you for your sweet words. Can't wait to see yours! Love the quilt! The fabrics are just so nice. Great job! Thanks Izzy! It was easy to pick from my jelly roll. 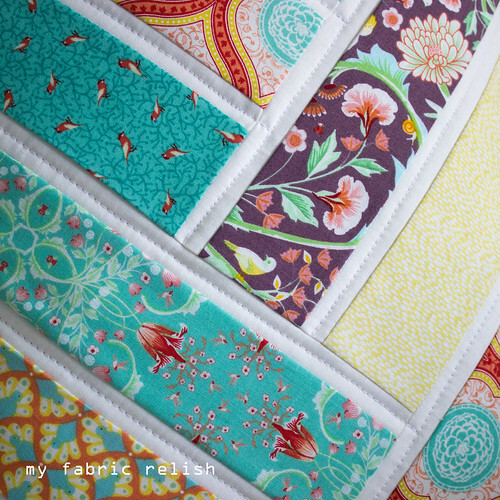 I actually bought the jelly roll as a quilt kit but fell out of love with it's intendedl quilt. I think I did it justice. Haha! Ohhh, those pillows are gorgeous!! What a great idea! Totally Pinning that to steal for Christmas presents... or for me. Probably for me. Thank you Alyce!! That's why you must make two...less guilt involved! hehe Thanks for the visit and comment! 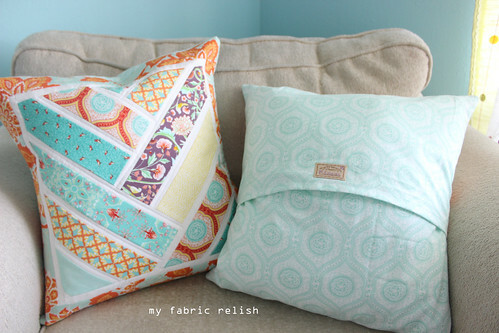 I love your quilt and cushions. Your fabric choice and colours are just fabulous. Love it!!! Thank you so much!! I bought a jelly roll and layer cake in this collection. I just love the little birds throughout. Thanks for visiting!!!! quilt looks great as do the cushions. Like you I did my blocks early, I have been doing the Tula Pink 100 sampler blocks, should be doing 3 a week and should just have finished no 51 all finished and now on the floor waiting to put them in order for joining up! Beautiful. Really love your cushions. I'm going to have to make another one now! Thank you! These are fun to do, aren't they!? The pillows were so fast to put together especially since I didn't do binding. Thanks for visiting me and leaving a thoughtful comment! Beautiful quilt! And I love the matching pillows! Thank you, Jennie! This was a fun quilt and so glad I had two extra blocks! Thanks for visiting! Thank you, Michelle! I'm so happy with the fabrics! Thanks so much for visiting and leaving such a sweet comment! Your quilt is beautiful! You have inspired me to make this block, actually the second one that has inspired me. I had to look very hard to find the mismatched seams and truth be known it doesn't matter because it is so gorgeous that it isn't noticeable! Pillows are lovely too! Your friend is going to love it! Oh, I'm so glad you are inspired to make this block! Even if it's only one! It's a lot of fun and that Molli Sparles is a hoot! 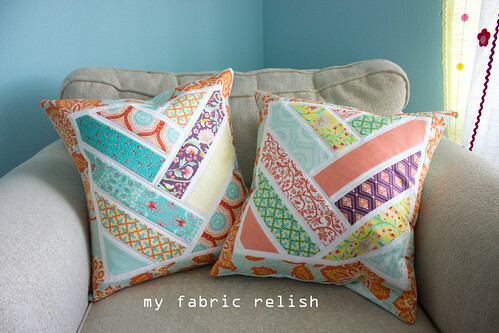 Wow, your quilt and cushions are fantastic! Very inspiring. Love it. Thank you so very much! I love getting inspired from others so I'm so happy to return the favor! Thanks for visiting and leaving such an awesome comment! they look great, people seem to be really pleased with how the MSBHQAL is shaping up, perhaps I should give the block a try. caution: you can not make just one block -- hehe, but they are such great fun...definitely give it a whirl because it doesn't take much to make one block. Thanks for the sweet comment! Those pillows are SO gorgeous! The quilt is over the top, I can't take it. I just might though...be careful haha. haha...thank you so very much! I'm so happy I made it. I wasn't going to at first because I was quite busy and then changed my mind and finished it up so quickly because I couldn't stop. So funny how the one you arent too excited about turns into a favorite/fun one. Thanks for visiting as always!! 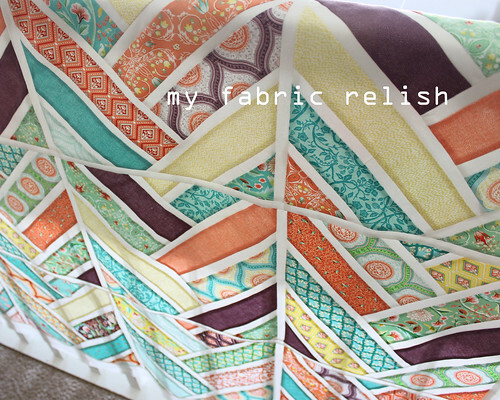 I love this quilt, it's beautiful! I really like your matching pillows! Thank you Wendi! I am so glad I had extra blocks for those pillows! Thanks for visiting and leaving such a sweet comment! Where does one find this pattern? Your quilt and pillow are absolutely fabulous. Hi Ava! Thanks so much! The pattern is called Broken Herringbone over at Play-Crafts.com and there is a QAL going on at Molli Sparkles. You must go check it out! What a fantastic quilt and pillows! I can see how you were excited to finish - they are awesome. Yes, they were so much fun! I am actually finished with the top and hope to blog about it this weekend! I love them! Thanks so much for stopping by and leaving such an awesome comment! Have a great weekend! I really like this pattern, & someday hope to make it. Yours is gorgeous. Aww, thanks so much Aimee! It really is a fun little block to make even if you only make a few for a baby quilt or make a bunch! Thanks for visiting and leave such a sweet comment! Thank you so much, Christine! I love the pillows and I just finished up the quilt and already loving on it! Now I just need to finish writing the blog post about it! Thanks so much for visiting! Very nice. I love the negative white, and that the made a border on the pillows. thanks so much! I am happy I went with the little bit of white sashing instead of the wider sashing. I almost used the pillow borders as part of the herringbones but decided I had enough fabric so I am glad it made a place on pillows and the backing for the quilt (which is finished now....whoop!). Thanks so much for visiting!